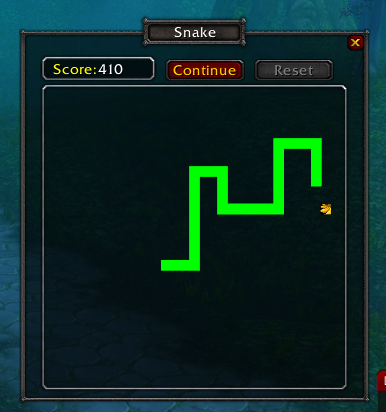 The classic Snake game made as an addon. I doubt this needs a lot of explanation! 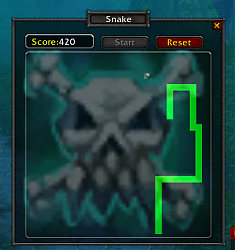 Simply type /snake to show the game. Move the snake with your arrow keys. While a game is running you can't use your keyboard to move in the game world but your mouse will still work. If you have suggestions, comments, please let me know! Game performance may vary, I have only tested it on my own computer so if you're running into problems give me a shout. First of let me just say that my role of Guardian of Dalaran has never been so enjoyable. Love this add-on. That being said i was just suggesting that you add w-a-s-d controls. it feels awkward in wow using arrow keys. "For any given direction, the choices should be a ninety-degree turn to the right or the left." Phrasing difference doesn't imply association with specific arrow keys. How annoying/confusing would snake be if the Left and Right arrows changed behavior based on the direction the worm was traveling? While traveling down, the left arrow would turn you to the right! Yikes. Thank you for your suggestions! Appreciated. Last edited by Motig : 09-10-10 at 08:49 AM. Hitting the arrow opposite the direction of your travel shouldn't be possible (IMO). What does that actually even mean in 2 dimensions? For any given direction, the choices should be left or right. I'm surprised nobody thought to make this for this long. Favorited! The only "bug" I could find by reading the code is that placeFood() will not take in account the slots that are busy (i.e. players snake occupies a block of the map). Other than that it's awesome! Actually, if food has been placed on a position where the snake's body currently resides it executes placeFood() again on the next movement of the snake until it's not on the body. But yeah it doesn't actually check where the body of the snake currently is for the placement. Last edited by Motig : 08-25-10 at 08:30 AM. Hey guys, glad you like it! Should make it multi-player, kinda like a slow tron..
pretty awesome, just DL and played it for a lil bit. works great for me. I've always loved playing snake.